Thanks to IAB Brasil I found a video of Seth Godin key note presentation on MIXX 2010 Conference held last week in New York. The sound quility is not the best but for the fans of the modern marketing guru this video is something very precious and new. • The Beatles: Teenagers already were a tribe, but needed leadership. The band capitalized on the opportunity to build loyalty with a pre-existing group seeking a champion for their message. • Nike: People always had running shoes, but Nike created a tribe of runners who are proud to wear a swoosh because of what “Nike” represents to athletes driven to achieve glory. The job of CMO today, should stand for “chief movement officer” and not chief marketing officer. In short: don’t market — inspire, lead, tap into your brand’s passions and you’ll tap into consumers’ passions and build a small and committed following that will scale through word-of-mouth, Seth Godin said. Update 2016! Video is not avaiable any longer. 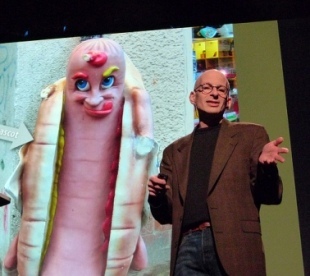 So I choose another video – The complete INBOUND 2015 Seth Godin keynote.